Submitted by Angarrack.info ... on Wed, 16/05/2018 - 18:14. 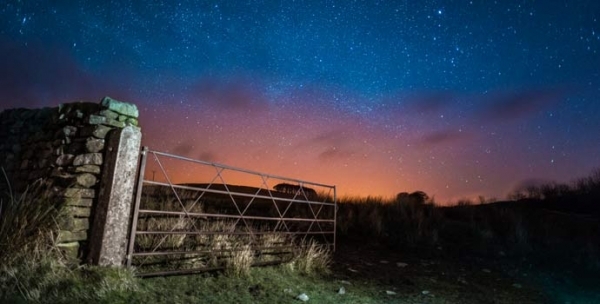 The Campaign to Protect Rural England has published maps of Great Britain’s light pollution and dark skies. Using data captured by a satellite at 1.30am throughout September 2015, the latest technology has been used to give an accurate picture of how much light is spilling up into the night sky and show where urgent action is needed. 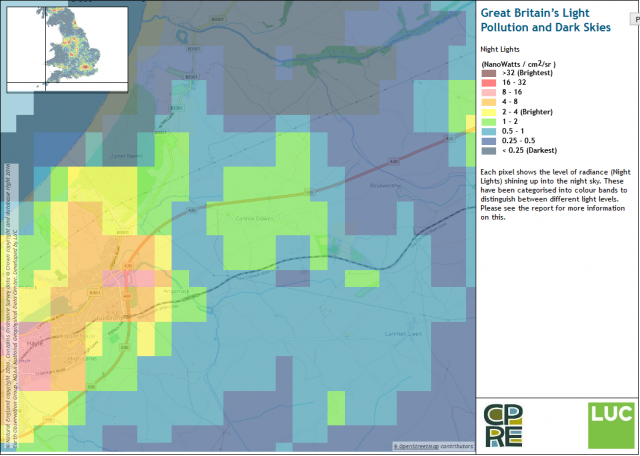 A report ‘Night Blight: Mapping England’s light pollution and dark skies’ has been produced by CPRE, which summarises the results of the maps nationally and makes recommendations to Government, local authorities, Highways England and others with the aim of reducing light pollution. Sadly, you're not alone in feeling frustrated by excessive lighting. Here are a few ideas about how you can take action about local light pollution. You can look up your local area on our interactive map and use this as evidence to help you shape future developments in your area, so that they either have well-designed lighting schemes or are refused permission if they would cause light pollution in existing dark places. You can use the maps to lobby your local council about light pollution, for example if a particular light source is a problem, and raise the issue with your local MP. You could also write to your local newspaper to raise concerns about local sources of light pollution. Parish councils and community groups can use the maps as evidence to inform neighbourhood plans and to shape local decisions about lighting, such as street lights owned by parish councils. Schools can use the maps as an educational resource to teach students about light pollution and the value of dark skies; a lesson plan for Key Stage 1 and 2 children is available in the ‘resources’ section of this website. The maps will also help you find your nearest dark skies, to escape from nearby light pollution and experience a truly dark starry night sky! In 2010, CPRE and the British Astronomical Association's Commission for Dark Skies ran a survey to find out how people's lives are affected by light pollution. Almost 1,400 people took part and the survey revealed that the main causes of light nuisance are road lighting (89%), domestic security lighting (79%), street lights that are more than five years old (77%), businesses (56%), sports grounds (53%) and supermarkets (41%). Almost two-thirds of the light pollution came from a source with an established lighting scheme (65%) such as a development that has been in place for some time. A total 82% of respondents said that the offending lights were left on all night. In many cases there is something that can be done. The first UK law tackling light pollution came into force in 2006 under Section 102 of the Clean Neighbourhoods and Environment Act (2005). Exterior lighting joins noise and smells on the list of things that can be treated as a Statutory Nuisance; things your local council's Environmental Health Department can take legal action against. The law makes 'exterior light emitted from premises so as to be prejudicial to health or a nuisance' a criminal offence. This law doesn't tackle all forms of light pollution, only incidents of particularly bad lighting from some types of premises which cause people real nuisance. 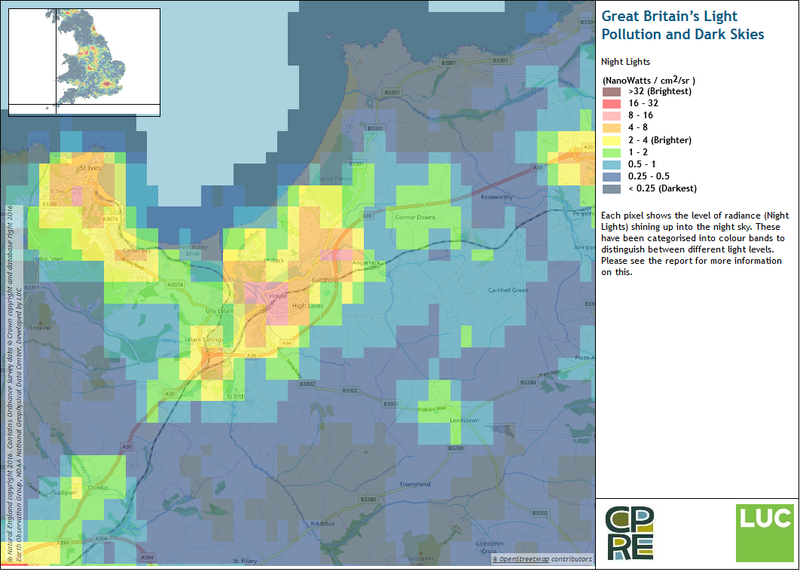 But CPRE would like to see it used, to raise awareness of the issue and to help people who really are suffering from severe light pollution. CPRE worked with Government and others to produce a leaflet about how to use domestic security lighting correctly. It gives helpful tips for your own lighting and neighbours with poorly directed security lights. View the guidance and read more about this lighting in the 'How to' guide to light as a statutory nuisance. If nearby street lighting is shining in to your home at night and causing you distress, you can contact your local council's street lighting department, explain the problem you are having, and ask what they can do to minimise the problem. You can find the contact details of your local lighting department through your local council's internet site. A full list of council internet sites can be found: https://www.gov.uk/find-your-local-council . CPRE's dark skies campaigner Emma Marrington emailed her local council about overly bright street lights on her road in Kingston, London. Within days the council had fitted a shield to the back of the light nearest to her home. If you would like to take action to reduce light pollution caused by existing lighting used by your business, or to ensure that new developments have well designed lighting schemes, we recommend that you refer to the Institution of Lighting Professionals Guidance for the reduction of obtrusive light.